Save time and order your groceries online! Get fresh produce hand-picked by their team of experts, quality beef straight to your home and the same fresh products delivered to your car! 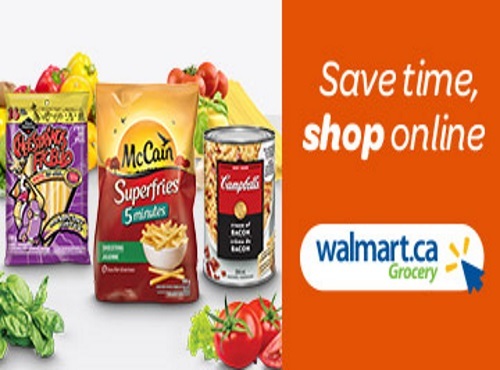 Walmart grocery is offering $10 off your order of $50 or more! Enter the promo code JULY10 at checkout. Offer available for a limited time only. 1. Log into your account on Walmart.ca, enter your promo code in the field, then click on "Redeem promo code". 2. Shop your favourite items and discover new ones. 3. During checkout, select "Edit" in the payments section and select your eVoucher from the drop down menu. You'll need a registered account to redeem promo codes and eVouchers. Promo code may be redeemed for Online Grocery only. Walmart PickUp fee and/or shipping fees may be charged where they’re applicable. Minimum PickUp order value is $50 before promo code can be redeemed. Note that this offer is only valid for grocery pick-up orders in Calgary, Edmonton, Ottawa, and the GTA. Click here to browse Walmart Grocery.